A hundred years ago, Holešovice was busy developing itself into a production powerhouse. Today the somewhat ragged ex-industrial neighborhood is home to many blue collars and working hands. 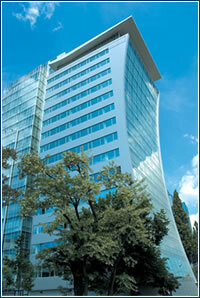 FOR OFFICE DEVELOPERS the district has many elements that suggest it as an excellent location. The usual factors contribute: a border with Prague 1 is bolstered by two metro stations. And then there’s the river. Jan Lovětínský, marketing manager for Lighthouse says this is a unique feature in Prague. Other stretches of the riverbank host parks and recreational areas, he claims, whilst it is only the very center of the city that is built onto the river, and there’s no plots available there. tenant, and ING Real Estate’s newly-unveiled refurbishment of the old brewery, entitled the Arena, has tempted Swiss publishing-giant Ringier to the district, developers say it can be hard to tempt foreign companies into Holešovice. Although Lovětínsky points out that until recently there was very little new-built class A office space that could host international companies, managing director of Lighthouse, Tamir Winterstein, says that Czech clients are much quicker to recognize the benefits of Holešovice, and they are helping to fill the 23,000 m2 at Lighthouse Vltava Waterfront Towers. and office space. The offices now online cost around CZK 1 billion, according to Lovětínský, who reports that the zoning permits on the first phase of Holešovice Port, as he calls it, are now in place. Across from the Lighthouse complex is another glass tower: Tokovo. 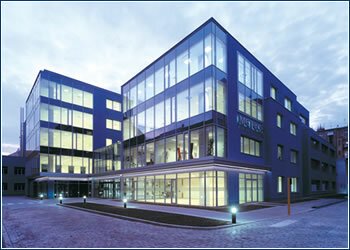 Having just been refurbished by PPF Majetková, it is now also renting space through DTZ and Gavlas agents. This could be another sign that Holešovice is struggling to attract top tenants. However, this district is still said not to have the best image. Among the reasons for this are the lack of extensive retail and services, and the fact that the district is still far from glamorous. Developer Ablon celebrated the opening of Building B, part of its Meteor Centre Office Park, in May. The 10,000 m2 building is set within the courtyard of a large block of buildings next to Sokolovská St. in Karlín, a stone’s throw from the Křižíkova metro station. It complements the first phase of the office complex, Building A, a reconstruction of a historical building that opened in 2002. BUILDING B is completely modern, offering four storeys of open-plan, fully divisible office space. The architecture, which stresses comfort in the work environment, utilizes ample glass, and a line of Italian tiles made especially for the building. Other notable features include a 134 m2 atrium, 24-hour security, an electronic access system, and air conditioning in all parts of the building. The building offers 124 indoor and 16 outdoor parking spaces. “So far we have leased approximately thirty percent of the building,” says Andrea Ševčíková, Ablon’s marketing manager. The tenants include the American real estate kingpin Remax, pharmaceutical firm Astellas, and credit managers Atradius. “The number of companies expressing an interest in Karlín for their headquarters is something we didn’t see two years ago. We’re encouraged that they’re seeing the area as a competitive location and the prices are still better than other locations next to the city center,” says Ševčíková. »The first holiday job was in fact with Healey & Baker in Brussels at the age of 16. I ended up joining H&B following university at the age of 21! What made you decide on a career in real estate? »The excitement of my first job with H&B got me hooked. Property had also been in the family and seemed a natural route. »While looking after C&W/H&B’s International Retail team in London, much of the focus was on central Europe. Just over four years ago Stephen Screene (my boss at the time) persuaded me to move full time. Did you see yourself becoming the head of a major agency? »It was always my ambition, and moving to Prague made it possible. »My goal is to constantly re-invent and to push others to do the same. The crux of the service industry is to deliver your customer’s dreams, not just their needs – this is also my aim. What do you like most in the real estate business? »I love working with people and changing the face and identity of places. What do you like least in the real estate business? »People that have bought a flat and think they know the market inside out. What was your most challenging deal? »The initial phase of getting projects such as Metropole, Letňany, or Palladium off the ground is always a challenge. »I try not to be, but when you enjoy it so much, it’s tough to avoid it. »Recently windsurfing, sky-diving, running, wakeboarding and rafting – but my real love is sailing.